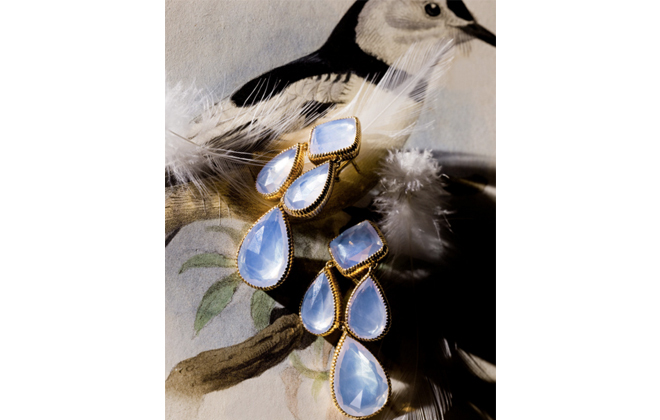 For years I have been obsessing over the bright, colorful gemstones of Larkspur & Hawk’s antique-inspired line of jewelry. 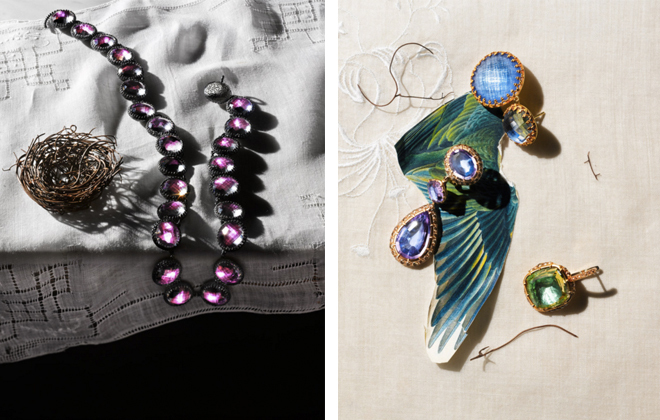 The “heirlooms of the future” as founder and head designer Emily Satloff has described them. 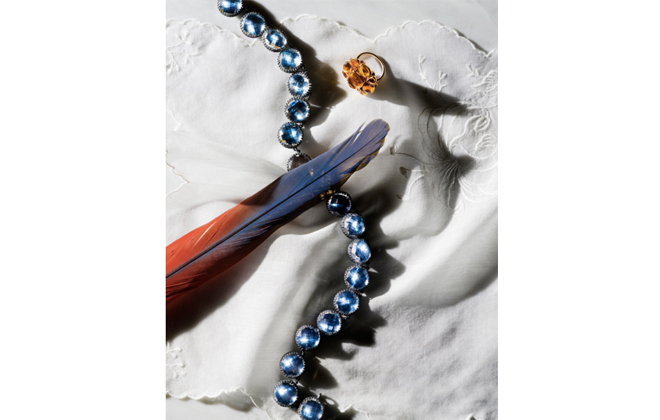 Satloff, who spent years working as an antiques collector and later as the Head Curator of Decorative Arts at the New York Historical Society, has always loved the special handcrafted quality of antique jewelry, noting that the uneven but unique quality of each piece is lost in contemporary machine production. 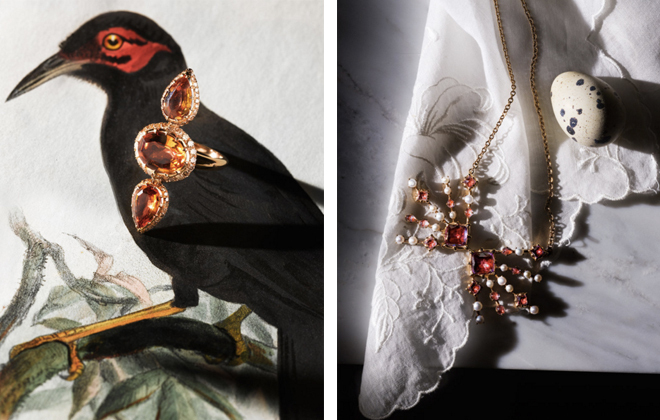 When Emily decided to take her love for antique jewelry beyond just collecting, and start making her own designs, she knew she wanted to keep the line closely inspired by the Georgina period, while still having a fresh modern, everyday take. 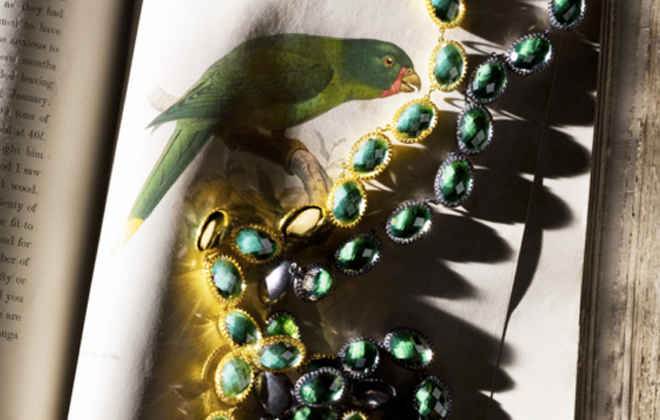 To achieve this, she employs the 18th century art of foiling, which involved applying carefully developed painted or textured foils to the back of each gemstone before setting the stone it its closed back setting. The process was developed as a way to enhance the natural glow of the gem, adding color and radiance to hand cut stones, but also meant to refract off of the candle light (the main light source of the time). The results are literally brilliant! The stunning images in this post were photographed by Horacio Salinas with creative direction and styling by Talya Cousins, and appeared online in T Magazine. This necklace is the most beautful color of blue, isn’t it? More of her timeless creations. Fabulous, aren’t they? This incredibly labor intensive process was mostly discarded during the industrial age, with the onset of mechanical stone cutting which achieved a much brighter clarity and sparkle than hand-cutting. But the colored foil gives a kind of glow that cannot be achieved with even the most sparkling, clear cut stone, which is why this lost art has been so carefully and lovingly revived by Larkspur & Hawk. There are so many beautiful pieces in this collection, I don’t know how I could choose just one! Maybe I should heed Emily’s own advice, who told The Stone Set that “if there could be only one piece from Larkspur & Hawk that a woman should own, it would be a rivière.” Not a bad place to start. Now I only have to choose which color…and what goods I’d have to “hawk” to get the funding to do so!